I could write a book about all the crazy, insane, and out of this world experiences I had at World Class Chili. But I will start with some podcasts. I cannot say enough good things about the lessons I learned or how deeply Joe Canavan changed my life… But I will try. Another live audience talk recorded at story story night in Boise, Idaho. Pike Place employment at Jack’s Fish Spot and Emmett Watson’s Oyster Bar. 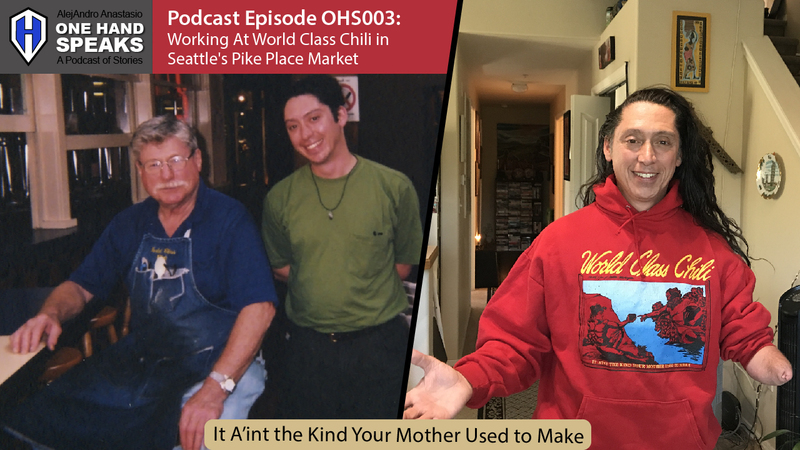 How Nancy at the Pike Place Market Creamery helped me get my job at World Class Chili… I think?! Working for Joe Canavan at World Class Chili. A Pike Place Market standing ovation after two years working “hard time” for Joe. The lessons learned working at a hole in the wall chili parlor. Pike Place Market – World Class Chili was located in this famous Seattle open market. Original Terlingua International Championship Chili Cookoff – Joe competed for years. Enough said! Soup Nazi – If you know this character you know a bit about Joe Canavan and World Class Chili.